I must confess that I am quite in love with astronomical clocks and, thankfully, Italy is a fertile ground for coming across them. With their complicated dials showing not just the chronological time but also all sorts of astronomical information like the location of the sun and the moon in the sky, they look beautiful, albeit a bit esoteric to read (especially for an ignoramus like me). I remember being rather bad at astronomy at school – a subject matter I had the chance to learn (but not really try to understand) for a year in my Bulgarian high-school. On the other hand and just like every self-respecting teenage girl at the time, I was very much into astrology. So, I remember arguing with my astronomy teacher once over the importance of one over the other. In fact, as a lapsus linguae, you can hear me call these astronomical clocks ‘astrological’ and I had to very carefully re-read my blog post right before hitting the ‘Publish’ button just to make sure that I had used the right terminology through it. ‘So, it is an astronomical, astronomical, astrolo…, aaaah, astronomical clock’, I muttered to myself, quickly re-reading my text and I can assure you that if any errors have escaped my eagle-eye revision, they were made completely unwittingly. there are many of them in Italy. 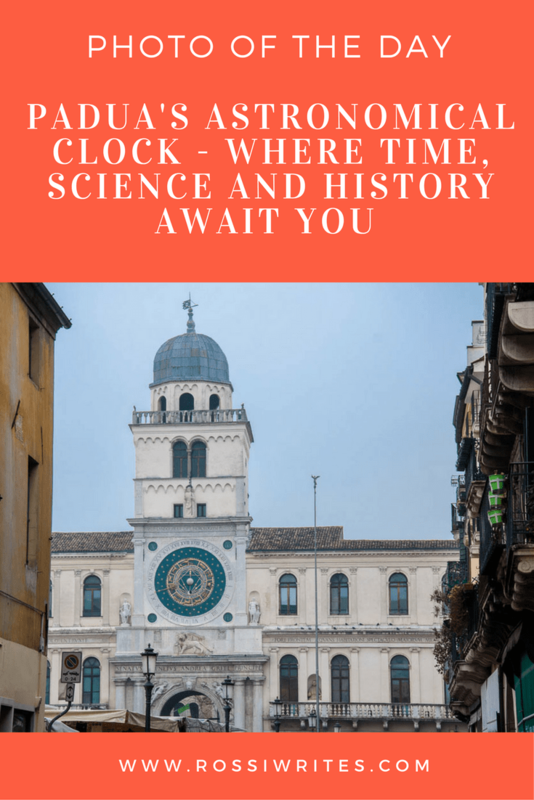 Cremona – with its accolade of being the largest astronomical clock in the world. You will find it embedded in the tower of the Loggia del Capitanio. From this vantage position it presides over Padua’s heart – Piazza dei Signori. It has a very interesting story and some even consider it to be the oldest clock in the world. As I am not an expert, I am not going to dig deeper into this claim. Especially, as I know of at least two other places claiming to be the birthplace of the oldest clock. One is Chioggia and the other one is St. Albans in England, which also happens to be my husband’s hometown, so in the interest of domestic harmony, please, excuse me, but on this occasion I cannot take Padua’s claim at face value. The last portion of his name actually means ‘of the Clock’. Just imagine how dedicated he must have been to the clock-making art in order to deserve such a moniker. Signore Dondi was a professor at the Medical School of the University of Padua and had a passion for astronomy. As such he was commissioned by Prince Ubertino I de Carrara to build a public clock. The resulting mechanism was installed in 1344. It had a 24-hour dial and it showed the position of the sun in the zodiac and the current phase of the moon among several other pieces of astronomical information. It happened either in 1390 when the armies of Milan stormed the city and burned the Palazzo del Capitanio. Or in 1399 when the Venetians took over the city. In any case, what you can see today in Padua is a faithful copy of its first astronomical clock. This copy was made in 1423 which makes it so old that the term ‘copy’ sounds a bit preposterous, to be honest. I mean, I have seen originals which were much younger than this copy. One is that at noon the hour hand points straight down instead of straight up. This is because the dial is divided in 24 rather than 12 sections (like the clocks we are used to). The other is that and, if you look closely, you will see it, there are only 11 signs on the zodiacal circle. The missing one is Libra. Some say that it’s missing because Jacopo – the creator of the original clock – never included it in its designs as a sign of protest against the cruel rule of the Carraresi family over Padua. Others say that the Libra sign was omitted when the copy of the original clock was made, as the person who recreated it was upset at not having been paid the price he expected. And the third is that the clock follows the geocentric model of the Solar system with the Earth being in the centre of its dial. I think I have photographed it from every possible angle. I like this particular photo of it as it shows it in the context of the city. Here the clock serves as the focal point and it is framed by the buildings which line up Piazza dei Signori. It overlooks the market which takes place there every day (can you see the awnings at the lower end of the photo?) and yet, in this realm of daily life, it stays removed from it and always on a higher ground. One thing I really want to do between now and Christmas is, actually, visiting it. You can experience up close Padua’s astronomical clock as part of a guided group on Wednesdays, Fridays and Saturdays. The number of people they admit is very small and so far I have never managed to visit Padua on the right day and at the right time, so I need to see when I will be able to go see it. Have you seen Padua’s astronomical clock? Or any other such splendid mechanism in Italy or anywhere else in the world? Let me know. This post is part of my new series of blog posts. Called ‘Photo of the Day’ I use it to share with you a photo which reveals the beauty and the reality of living in Italy and travelling in Europe. These are usually short posts (sometimes more of a caption, really), so that you can enjoy them on the go and use them to bring a ray of colour into each of your days.